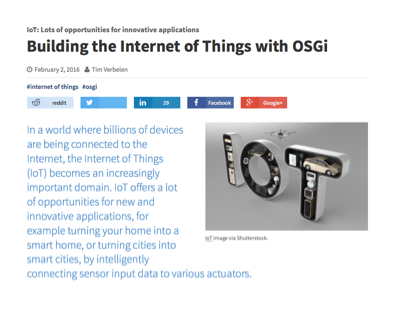 There is a great article published earlier this week in Jaxenter talking about the important role that OSGi has to play in IoT. The article is by Tim Verbelen from iMinds. Tim is an invited contributor at the OSGi Alliance. Tim discusses how the OSGi service model offers an elegant and easy way to deal with the challenges presented by the sheer volume of different devices, APIs and protocols, and the different lifecycle requirements that they all have. The big improvements in OSGi tooling from Bndtools and OSGi enRoute are also covered. If you haven't checked these out for yourself then they are definitely worth a look. The article goes on to look at a Smart Home Dashboard case study that Tim has been working on with his colleagues at iMinds. And to emphasise the concluding point - you can get involved with the OSGi IoT Expert Group to help define and deliver the specifications to further improve the IoT experience and ensure that the interfaces to all of these devices are interoperable.